Note: Membership Dues for the April 2016/March 2017 year are $30. The SS Master has been supported with financial donations by many organizations, over the years. Individuals have supported the Society with cash donations and by purchasing souvenirs and regalia while the Master was dockside at Granville Island and visiting communities on the coast. 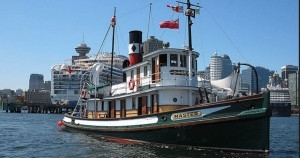 For many years the Master Society also had a presence at the Vancouver International Boat Show. Many members have volunteered countless hours over the decades and a very large number of companies and organizations have supplied materials and/or cash contributions over the years in order to save this grand old steam powered lady of our maritime towing industry. The Master will be 100 years old in 2022 – that’s just 6 years away. Our Centenary Project is designed to complete many much needed repairs and complete her restoration. Much remains to be done. If you can swing a wrench, or a paint brush, or even spin a good yarn, the Master needs your help.